Hair: Silver and of unknown length, as it is held up in an intricate hairstyle involving a bun and several braids. It is often covered by a green hood, crowned with an elaborate golden headpiece. 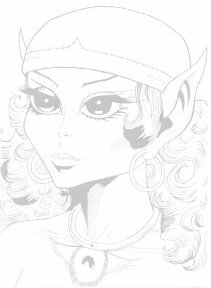 Life history: Savah is the eldest and most revered of the Sun Folk, and also one of the oldest elves alive. The Sun Villagers call her Mother of Memory, and she is their mother in the literal sense almost as much as Timmain is mother of the Wolfriders, as Savah and her mother were the two female elves of which the entire Sun Village sprang. The two of them, together with the three male elves Yurek, Dreen and Maalvi, crossed the desert to escape humans and founded Sorrow's End in the oasis they found. Savah is calm, serene and wise, posessing the magical power of astral projection. She is the village's closest thing to a leader, and always the one people turn to with a problem. She is also the one who mentors anyone with magical powers, like Rayek, Suntop and Ahdri. Twice in her long life Savah has been in danger of dying. The first time was when Winnowill caught her spirit on the astral plane, keeping her trapped so long that Savah's body had all but withered and died when she was finally released when Winnowill was wounded. The second time was during the human attack on Sorrow's End, when she was shot. Although she had initially refused to leave the Sun Village, she was now forced to. Savah currently resides within the Palace together with the rest of the Sun Folk, until they can find a place to build a new home for themselves.